These annual gatherings can take place anywhere in the world so you might as well take the opportunity of going whilst it's in Paris. "Becoming an organisation that appeals to a broader range of political activists, and becoming more accessible is the first step towards rebuilding Conservative Future so that we can expand in a whole new direction. 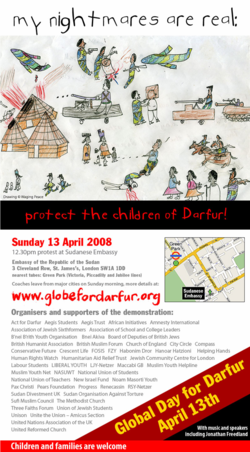 To that end, we are pleased to announce that we are official supporters of “Day for Darfur 5”, a protest against the crisis in Darfur with particular focus on the affect that the situation is having on the children of Darfur. When David Cameron visited the region last year, he did so because the humanitarian crisis is affecting millions of individuals and we should be doing more to alleviate the suffering. It is unacceptable to stand aside whilst government back militia attack innocent civilians." If you live in London I strongly recommend going to this. That CF is engaging with this serious issue like, for example, the young LibDems (and later the IYDU) did with Belarus, is very welcome indeed. “Following a study visit to Belarus by DEMYC –a member of IYDU – ten Belarusian activists were arrested and imprisoned by the Belarusian regime because of their political beliefs. An international delegation of DEMYC youth activists from across Europe conducted a study visit to Minsk on January 10-13, supported by the European Youth Foundation. After the departure of the DEMYC delegation, ten members of the hosting organizations Belarusian Popular Front (BPF) Youth and the Young Front (Malady Front) were arrested and imprisoned. These people are Franak Viachorka, Anton Kalinouski, Yuras Stankevich, Uladzimir Syarheew, Kasya Krasnova, Lyudmila Atakulava, Kasya Halitskaya, Maksim Vyarnyanski, Paval Kuryanovich and Volha Kulyakevich. These ten young people were arrested and have been sentenced for up to 15 days in prison without any justified reason. They have been sentenced to prison for "using bad language". Some of them were beaten by the police in order to confirm their participation in a peaceful demonstration. IYDU is urging people, institutions and organisations across the globe that stand for freedom and human rights to join together in support for the human rights of the people of Belarus. IYDU has been working with our sister parties in Belarus for a number of years. Last year they hosted a training conference for young Belarussian activists. An IYDU Vice Chairman was able to get into Belarus last year on their annual Freedom Day march and witnessed first hand the tactics of the police in how they deal with political marches. 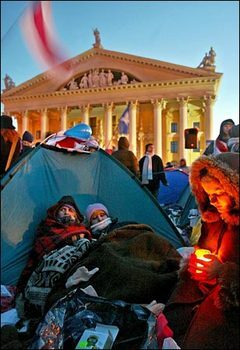 If anyone would like to get involved in the IYDU Freedom Campaign for Belarus just email Sarah Southern. I can reveal this year's Freedom Forum will be held in Taipei, Taiwan, from the 5th to the 8th of July. The topic of the meeting will be free trade as a driving force for democracy and prosperity. The IYDU's annual Council Meeting was in London last December, and last year's Freedom Forum was at Ronald Reagan's ranch in Santa Barbara. In Norway, we have a Conservative Party (Høyre) established in 1884, Norway's second oldest political party (the oldest being the Liberal Party, established in 1883, the Labour Party was established in 1887). Currently (since the General Election 2005) we have only 28 MPs in the Storting. In the previous Parliament (2001-2005), we were part of a coalition Government with the Christian Peoples Party and the Liberal Party. The Christian Peoples Party had the PM, but we held most other important offices, like Finance, Foreign Affairs, Defence, Local Government. The Conservative Party (Høyre) has long tradition for working together with like-minded conservative parties. We have cooperation with Nordic parties (party leaders meeting, party secretary meetings, spokesmen meetings), and we are part of the Conservative Group in the Nordic Council. We were members of the now defunct European Democrat Union, and are now observers in the EPP. We are also members of the International Democrat Union. IDU now has its headquarters in Oslo, the new Secretary General is Eirik Moen, former Secretary General of Høyre and former state secretary in the Office of the PM. Peter Martinovic (excellent blog), leader of Slovak Young Conservatives, has kindly produced this summary of centre-right youth activity in Slovakia. Thanks also to PragueTory for facilitating this. With the IYDU conference starting in London on Wednesday, CF Diary is featuring articles that raise awareness of the nature of some of CF's sister organisations around the world. A Prague resident and Conservative Abroad member today offers an insight into the main Czech centre-right youth organisation. The dominant party on the right of Czech politics is the ODS. 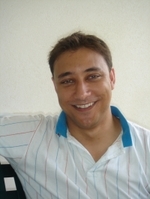 In July 2006 the ODS leader Mirek Topolanek agreed to tie up with the Conservative Party to form a new reform grouping in the European Parliament in 2009. The ODS is by reputation the party of the cities and the educated middle classes, but is also the largest party in terms of overall support. Margaret Thatcher is a great heroine to most ODS activists and politicians who are in the round fairly Euro-sceptic. Only last week, ODS member President Klaus described himself as “deeply frustrated with the EU”. The young conservative wing of ODS is called Mladi Konzervativci and was established in 1991. Its members number 500 across 35 branches. In a country of nine million these are hardly stratospheric numbers, but I am told they are growing. It is estimated the membership is 80% male. Interestingly, the overwhelming majority of members are either at high school or university. This year's Council Meeting of the excellent International Young Democrat Union will take place in the Houses of Parliament and other London venues from November 29th to December 3rd. For the uninitiated the IYDU is the youth-wing of the IDU - an alliance of 80 political organisations who share a common belief in freedom and "less government". We have a great deal to learn from like-minded people from different cultures, co-operation and communication is absolutely essential for the global revival of centre and centre-right parties. The main theme of the CF-hosted conference is “Renewing Conservative Parties”, and David Cameron is scheduled to speak at it, as well as other "leading parliamentarians and high level campaign strategists from the Conservative Party". The New Media (satellite/internet tv, blogs etc) is also a focus of the conference, with think-tankers and journalists discussing how the New Media is developing. Click here to download a registration form, and email it to [email protected] by the end of October. IYDU meetings take place all over the world, so take this opportunity to go while it is easy to get to! Mark Clarke: What can we learn from other centre-right parties? So firstly the facts. The youth wing of the centre-right UMP party have just had their youth conference. At this conference they elected their new leadership on a 60% election turnout. Nicolas Sarkozy, the leading light leader of the right went and addressed them and used the opportunity to launch his election bid for President. His addressed was received by over 6,000 young UMP delegates. The French Prime Minister, Dominique de Villepin also attended. Conference Attendance: CF had two National youth conferences this year. Each was attended by around 60 people so a total of 120 delegates. The French UMP was attended by over 6,000 delegates. CF Election turnout: Last year’s CF election had a turnout of around 3% (based on around 500 leadership ballots from a declared membership of 15,000). I hope that this year will be higher but will we match the French UMP youth wing with a turn-out of over 62%? Senior Party Interest: No contender for the Conservative Party leadership integrated CF into their leadership bid. By contrast, Nicolas Sarkozy launched his at the UMP youth conference. In addition, Dominic de Villepin, the French Prime Minister, also attended their conference. Clare Hilley: Sri Lanka - The New Rwandan Crisis? Clare, training to be a pilot, is Chair of Croydon Conservative Future and has previously held branch, area and national positions within CF. Having stood in local council elections in both Lancashire and Croydon, she believes that CF should engage in and explore international issues. The genocides and ethnic cleansing of the Sudan and Rwanda are all too well known. But the murders of innocent Sri Lankans have been occurring for nearly twenty five years, and yet few know of the devastating effects the government there is having on its minority peoples. The Sri Lankan population is made up of two main groups: the Sinhalese (mainly Buddhist) who comprise seventy four per cent; and the Tamils (mainly Christian and Hindu, and of Indian descent), who make up 18.1 per cent. In 1948, after gaining independence, the Sinhalese dominated parliament passed the Ceylon Citizenship Act. This stripped the majority of Tamil plantation workers of their citizenship, and hence their vote. The law stated that only those born before November 1949, to a father who was also born in Ceylon, were eligible for citizenship.